The wolf is on the edge of society wanting, deciding whether, to come back in. The wolf has been hunted and abused to the point where it has removed itself from the common place. It is a social animal, lives in a matriarchy with powerful feelings about its young. This is the essence of the remedy. These are individuals who have been on a journey, have looked at their darker side and are now considering coming back into more formal society. There is a wildness to this state, they are trying to access a wild side, their shadow side, but they are also social animals and may connect with others to find this wildness, a wild society. I had a dream of being at a table and I was supposed to cut peoples throats – didn’t want to and didn’t. She reported that friends were something she loved and had been thinking about, she needed to set balance between time with self and with others. She rubs her wrist on her arm to scratch rather than using her hand. After LAC LUPANINUM 1m csd she went on to meet her birth mother once and decide not to see her again. She did a graduate teacher training course got a job and found a relationship. She became pregnant (the original reason for seeking help was she was worried about her menstrual irregularities and possible infertility) and, when the child was born, she stopped work and stayed at home with her child. That’s quite a coming into society! On reflection her adult relationships, while abusive and involving drugs, had been wild and she kept on the move (from country to country). She needed the serial relationships and, even though many of the partners had been controlling and one contact had ended in an abortion, she had come “home” to recover and hopefully to change. There are many stories about humans being raised by wolves, not least Romulus and Remus, and other stories of wolves being raised by other animals. The idea of adopted parent is intrinsically woven into the remedy. There is also the expression “lone wolf”. The lone wolf is outside the family matriachy, while it is able to survive with its predatory skills it is more vulnerable. Wolves live in a tight family community and often young are expelled to keep the integrity of the group intact. There are stories of other animals adopting these outcasts. This fundamental feeling of being in or out of the family, in or out of society, prevails. 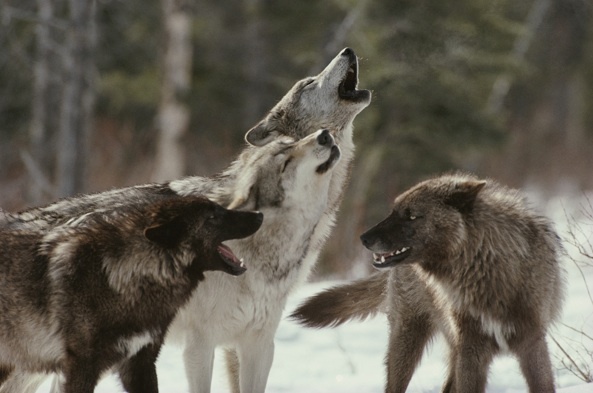 Wolves are extremely social animals. They exist as a social unit called a pack. Wolves travel and hunt in a group and perform almost all other activities in the company of fellow wolves. Wolves rarely hunt alone and in the remedy there may be a close friend that they share their seeking with. Wolves survive on smell. In the remedy there is a heightened sense of all six senses. Smell, especially worse for the smell of blood, blood can smell putrid. Sensitive to touch and may find clothing tight or restricting. Underclothing may make the individual feel trapped. That aspect of emerging feminism; over a century or more women have abandoned the chastity belt, then the corset and subsequently the bra. All these are stages in an un-bonding of the feminine. In LAC LUPANINUM there are these feelings of being trapped, especially by someone or something. Vision is also sharp and, unlike LAC CANINUM, this remedy looks you in the eye. Their vision is acute as is their inner vision. The journey to the inner-self can often be the society they are trying to get to, not the worldly society that they may already be well established in. There are always going to be issues around being trapped, the individual cannot tolerate being tamed, this can be the world is the wrong place to be in or, they are wary of relationships but they are looking for one. Sill they long for the wild, yearn for nature where they can transform (as in the werewolf) and are affected strongly by moon cycles. In the case I outlined there is the animal-ness of rubbing her wrist to scratch, the animal has paws not fingers. LAC LUPANINUM will be strongly protective of their children, this may be demonstrated by anxiety about getting pregnant, anxieties about their relationship, themselves (as a mother/father) or their partner. This, combined with issues about being trapped (they dream of tunnels or fenced enclosures) and being anxious about failing in some way, falling from grace, not being accepted can make the transition to parenthood difficult. As adults they can feel childhood abandonment as in the case above, which may present as lack of self-confidence and look like LAC CANINUM. They like the colours black, white and red, these are the colours of STRAMONIUM. However in STRAMONIUM there is this constant terror, cutting, birth, death, violence and separation. The energy in LAC LUPANINUM is they have their own power, there is an animal need to survive and the redness of blood and its smell is significant and stimulating but LAC LUPANINUM is not suffering form the terror and violence of their situation. Living on the edge they need to survive, the remedy is from the animal kingdom, so they are ATTRACTIVE or find ways to make themselves attractive. The wolves hunting patterns means they can go for days without food and then have a feast. These symptoms show in a HUNGER FOR LIFE, VIVACIOUS and LIVELY. They are engaged with the process with the practitioner but, of course, this can be the same for many animal remedies with the issues of survival constantly represented in animal remedies. The unreliability of food for the wolf means LAC LUPANINUM often have food issues. Appetite increased, go for long periods without eating and then eat large amounts (binge eating and drinking). Wake at night with a need to eat. Nausea in pregnancy and travel sickness. Heaviness, bloating, fullness, even after little food. They like beautiful food, well prepared or not caring at all what they eat. Flatulence, diarrhea, green stools. FEMALE Menses: Left side ovarian pains, sharp stabbing. Sore breast, breast lumps. Aware of details of menses. Cycle follows moon cycle in the healthy so is something that may be there or the client moves towards. Nose sensitive to smells, can small blood, may smell putrid, particularly sensitive to human smells. MOUTH pains in jaws, teeth sensitive, sensation long or toot large. Taste sensitive, bitter. SIXTH SENSE; lots of symptoms here, connected to ancestors, aware of environmental and atmospheric changes. Sensation as if drugged. PHYSICAL EXERCISE helps calm these symptoms if they get out of hand. Attracted to meditation and yoga. Dancing and moving in circles. The wolf tracks in circles. Ravens are sometimes known as “wolf-birds” because they form social attachments with wolves. 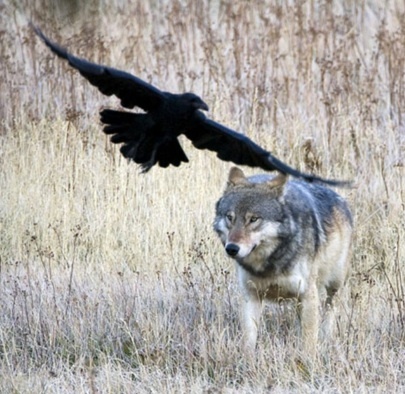 Where there are wolves there are often ravens that follow wolves to grab leftovers from the hunt or to alert wolves of a prey, and to tease and play with the wolves. They play with the wolves by diving at them and then speeding away or pecking their tails to try to get the wolves to chase them. Expect some links with the two remedies.